Ripple’s solutions are going through tests by various companies that find its products attractive as they attempt to improve existing services that take place when it comes to cross-border remittance. Despite that we call them tests, its a win every time because cryptocurrency comes out at the apex of their expectations. Keeping in mind that their products [xVia, xRapid, xCurrent] are very reliable and functional, not many find it surprising that banks or financial related firms try to utilize the technology. As an example, Bank of Ayudhya [Kungsri] will be testing again, Mitsubishi Corporation stated that international transfers will be performed via the products. It will be in Singapore and Thailand. The above mentioned partnerships, are without doubt major impacting factors when it comes to Ripple’s long term. They showcase how reliable the network and platform is. Both Mitsubishi Corporation and Standard Chartered are among the world’s powerhouses. Their liquidity is absolutely without question. If they can turn to Ripple after the pilot works well, that could change its history for good. Ripple’s CTO – Stefan Thomas, has announced via twitter a new startup building micropayment apps on interledger and XRP. To have better rewards for individuals using the platform while producing better incentives for digital content and apps, the business model will use Ripple’s interledger protocols. Evans Schwartz and Chris Larsen from Ripple joined the team of the model. There is still no release date announced, but it is expected to be on the web in the near term. The firm behind the coin will be backing up the project completely. For many times now, the prices in the crypto-market have rocketed away because of speculations. But, below you can see something surprising. In 3 years XRP reaching $334,47 against the US Dollar. For the value to climb that dreamy ladder, the platform has to reach its original goal – replacing SWIFT system. The SWIFT system has proven to make the customer experience very poor. Problems like long periods of times per transaction, high fees are charged per operation are always present. If the existing issues are solved by platform completely and accordingly a mass adoption by financial institutions takes place, XRP could go even higher. 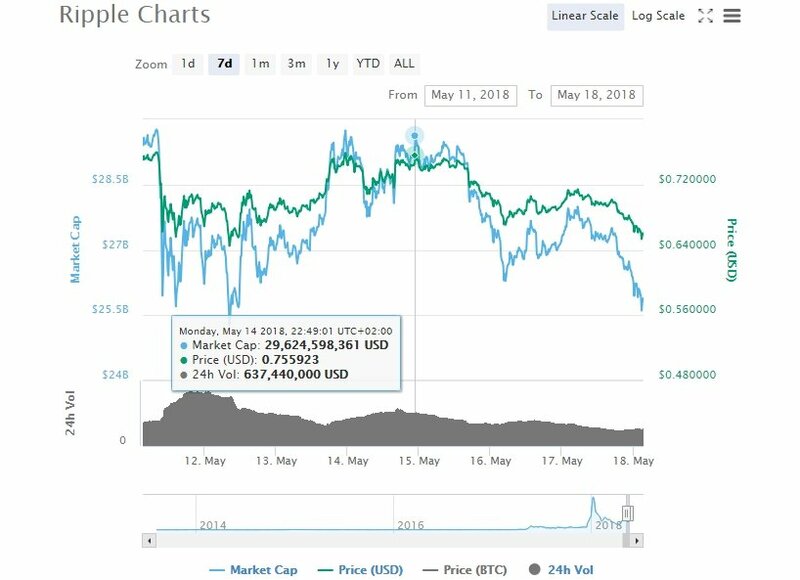 According to Coinmarketcap – the pair XRP/USD for the time being is trading at $0.6640 with a 6.06% drop in the last 24-hours.